Unless you're thinking mid-1940s East Coast priestly ordination, your eyes aren't deceiving you with that shot above. Then again, said conjure wouldn't have taken place on a football field: it's a scene from the aforementioned liturgy last weekend at which 60 permanent deacons were ordained for the Santa Barbara region of the archdiocese of Los Angeles, with Cardinal Roger Mahony as ordaining prelate. The ordination of 60 men to the Permanent Diaconate at Santa Barbara City College's La Playa Stadium represented the largest single group of deacons ordained at one time in the history of the Archdiocese of Los Angeles, and possibly in the country. Held a week following the ordination of seven deacons in Los Angeles, the celebration also represented the successful efforts led by pastors of the Santa Barbara Region (Ventura and Santa Barbara Counties) to draw forth more men to ordained ministry in their local parish communities. "This is one of the most glorious days of my 40 years of priesthood," declared Santa Barbara Region Auxiliary Bishop Thomas Curry, who oversaw the formation process that began in 2002, and who delivered the homily at the ordination Mass. "Your presence is testimony to the good work of God that is present in all of you." Referring to the day's second reading from the Acts of the Apostles (Peter's speech to the disciples), Bishop Curry reminded the deacons and the assembly of the Synod's first pastoral initiative, which "speaks to our call to evangelize, to testify to the power and goodness of the risen Lord. As deacons, believe that God has called you to continue the renewal of the Church by testifying to the faith and power of God manifested in you." 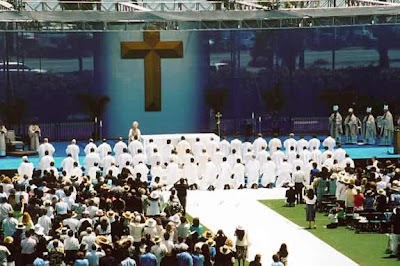 The celebration began with the 60 deacon candidates --- the 56 married men accompanied by their wives --- processing into La Playa Stadium to the sounds of "Joyful, Joyful, We Adore Thee," in front of more than 3,000 cheering family, friends and parishioners from around the region. Several wiped tears from their eyes as they made their way down the middle of the football field and to their places. "This is an important and historic occasion," noted Cardinal Roger Mahony in his opening remarks. "We gather with great joy as you receive the sacred order of deacon. And we are so proud of you in this region, for the initiatives you have taken to bring forth the laity into this service." Pastors were invited to identify and recommend deacon candidates, "all of whom were actively involved in their parishes," said Father Quihuis. The candidates were divided into groups of English- and Spanish-speaking, who met respectively on alternate Saturdays (9 a.m.-4 p.m.) or on alternate Saturdays (2-6 p.m.) and Thursdays (7-9:30 p.m.). In addition to the ongoing service component, the first two years of the formation process were heavily Scripture-based, "to provide a solid foundation to build on," said Father Quihuis. Christology, systematic theology, church history and homiletics were also included in the process, with married candidates' wives --- also involved in service to the church --- encouraged to participate. All of the 60, Bishop Curry told them in his homily, "are a light shining in the darkness, evidence of the grace of God, the vitality of God, the goodness of God in his people."